Original use: residential. Andrew Stroup sold the lot to George Stroup in 1809, who in turn sold it to Peter Ruble. The home was constructed sometime between 1814-1825 by Peter Ruble as a retirement residence . Mr. Ruble was a retiree at the time(successful manufacturer from Potter Township) and is noted in the tax records as a “private gentleman”. The home’s architecture is Federal style, which became popular along the Eastern seaboard after the Revolution. Federal style ornamentation is evident in the fine dentils and punch work designs on the cornice and door. Note the similarity of the limestone to that used on Duffy’s Tavern. Historically, the backyard contained a stables, smokehouse, outhouse, and “a never failing well of water under cover”. Buildings for these purposes were common in most backyards during this time period. In 1846, Jacob Sweely, a coachmaker employed by James Logue at the Coach Works, acquired the property. Two retired farmers, Jeremiah Rankin and John Emmert respectively owned the property from 1858-1864 and 1864 -1879. Interesting to note that at this time, farmers in the area were able to retire to a more comfortable village life. Typically, they were able to do this by living off of rents from farms rented by sons or sons-in-law. From 1879 to 1912, the property was owned by local merchant J.N. Dinges and used as a pharmacy and residence. Current owners, Thomas family, are the 14th family to own the house. Items of note: The front porch was removed in 1950. 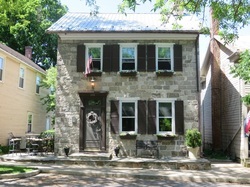 A rear, wood frame addition was added around 1842. The charming front patio and landscaping were added since 2001, as was a garage in the model of a barn.